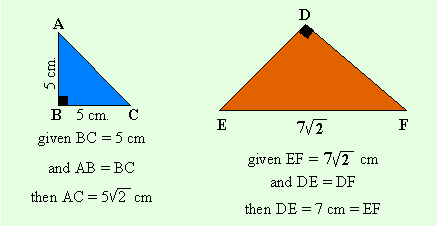 There are two right-angled triangles which occur frequently in our work in geometry, analytic geometry and trigonometry, which we should learn to make our certain types of problems easier to solve. They are the isosceles right-angled triangle and the 30°, 60° , 90° triangle. Using the Pythagorean theorem, we can determine the ratios of the sides of these triangles. The ratio of the sides is 1 : 1 : . So, if the equal sides measure 5 cm each, the hypotenuse is cm long. 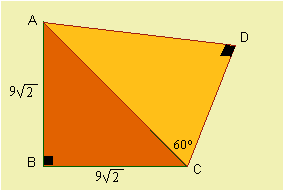 The ratio of the lengths of the sides in this triangle are . A sculpture is composed of 2 similar right circular cones. The measures are as shown. Find the total height of the sculpture to the nearest centimeter. 1/ The diagram shows the side view of a roof. c) find the area of the side of the roof. 2/ In the diagram, AB // DE and the measures are as shown. 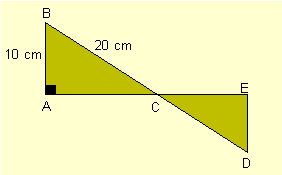 a) What is the measure of angle CDE? b) How long is AC? Find the lengths of all the sides and the measures of all the acute angles. 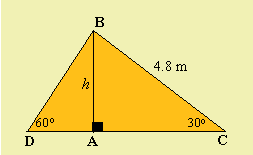 1/ a) Since BA or h is opposite the 30º, it = ½ the hypotenuse. h = ½(4.8) = 2.4 or 12/5 cm. Since DA is opposite the 30º, DA = BA ÷ root 3. Since BA // DE, angle CDE = 60º.